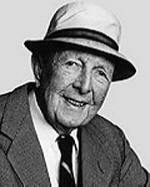 Archibald Joseph Cronin (1896 - 1981) was a Scottish novelist and an accomplished storyteller. Trained in medicine, graduating from Glasgow in 1919 but gave this up to become an author. Best known for "Adventures in Two Worlds" (1952) which gave rise to the radio and TV series "Dr Finlay's Casebook". He produced several best sellers with social concern or based the stories on his experiences as a doctor. Cronin continued to write until he was in his eightieth year. His books also gained a wide audience through film and television. Cronin was born in Cardross, Strathclyde, as the only child of Jessie (Montgomery) Cronin and Patrick Cronin. His childhood was shadowed by the death of his father and poverty. Cronin was educated at Dumbarton Academy at his uncle's expense. In 1914 he entered the Glasgow University Medical School, graduating in 1919. During World War I Cronin served as a surgeon in the Royal Navy. After the war he worked as a ship's surgeon on a liner bound for India, and then served in various hospitals. In 1921 he was commenced practice in South Wales. Three years later Cronin investigated occupational diseases in the coal industry. In 1925 the University of Glasgow awarded Cronin his M.D. and subsequently he started to practice in Wales and in London. Cronin's heath broke down in 1930. Whilst convalescing in the West Highlands of Scotland, he wrote his first novel Hatter's Castle (1931). The story depicted a Scottish hat-maker that is obsessed with the possibility of his noble birth. After its publication accusations were made, that Cronin had plagiarised George Douglas's novel The House with the Green Shutters (1901). However, the book was an immediate success and allowed him to give up practising medicine in favour of writing. In 1939 Cronin moved to the United States with his family. He wrote THE KEYS OF KINGDOM, a story of a Roman Catholic priest, whose years on the mission field in China taught him tolerance which the institutional Church finds difficult to deal with. After World War II Cronin travelled with his family in Europe. By 1958 the sales of Cronin's novels amounted to seven million in the United States. Cronin's humanism and social realism also made him popular in the Soviet Union. Many of Cronin's books have been adapted for films or television programs. The television series Dr Finlay's Casebook (1959-66, new adaptation 1993) was based on his stories. For the last 35 years of his life Cronin lived in Switzerland. He died on January 9, 1981, in Montreaux, Switzerland.